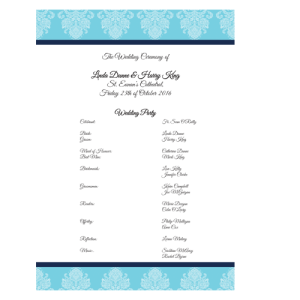 Weddingcardsdirect sell one size of wedding scroll this being an A4 page wedding ceremony scroll sold and delivered flat. Please note we do not provide ribbons or ties for wedding ceremony scrolls. It all depends on the style and theme of your wedding as to whether you use a scroll or a multiple page mass booklet. Our very popular ‘beauty and the beast fairytale’ wedding invites and wedding stationery include wedding scrolls and would definitely add a fairytale theme to your wedding ceremony. A ceremony scroll inform your guests of the marriage ceremony details and also list the names of your wedding party. However, unlike a ceremony booklet you will only be able to fit a small amount of text onto the ceremony scroll. You may choose to just include the names of the wedding party and a thank you message for your guests. You can email us or phone us 071 91 33409 with your details to weddingcardsdirect if you want advice on creating your ceremony stationery. A ceremony scroll is definitely the most cost effective and less stressful to put together for a bride and groom than a mass booklet. Ceremony scrolls tend to suit civil ceremony weddings perfectly. Additional information such as poems, quotes, verses, photos or images can be added to your ceremony scroll. Both sides of the scroll are available for design however it’s usually just one side that is used. A good design could incorporate a thank you piece to your wedding guests and parents at the back of the scroll or a lovely thoughtful prayer or verse or poem at the back of the wedding scroll. Our design team at weddingcardsdirect are ready to work with you to create your very special wedding scroll and create a truly lasting memento of your wedding day.